The American Heart Association says that Cardiovascular disease accounts for nearly 836,546 deaths in the US. That’s about 1 of every 3 deaths in the US. Cardiovascular diseases claim more lives each year than all forms of cancer and Chronic Lower Respiratory Disease combined. In 2016, I was diagnosed with Congestive Heart Failure and became yet another such statistic. However, by making certain lifestyle changes, improving my diet, and following a very specific whole food supplement protocol, I was able to fully recover! I invite you to join me on my personal journey as I battled congestive heart failure from utter despair to full recovery. I share the details of my personal experience with you and tell you exactly what I did to regain my health. 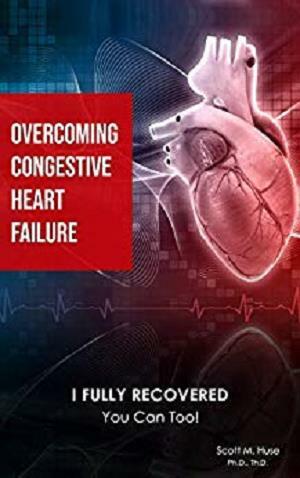 If you or a loved one have been diagnosed with congestive heart failure, you need to read this book. It could literally save your life or the life of a loved one.